2ND BDE - Operation Saratoga infantrymen uncovered an underground room containing more than 270 rounds of rocket ammunition and booster charges in a recent land clearing operation through the HoBo Woods. The find rates as one of the largest ammunition caches located to date in the 25th Inf Div operation, which started Dec. 7. The vault held 271 RPG-2 rocket launcher rounds, as well as 263 booster charges. Members of the reconnaissance platoon, 4th Bn (Mech), 23rd Inf, and the 27th Land Clearing Team discovered the cache as they were bulldozing an area in the southern sector of the woods. According to PFC Robert G. Rubin of Tucson, Ariz., who found the cache, the discovery almost turned into tragedy. Rubin said he was about to throw a hand grenade inside what he thought was an ordinary bunker, when he peered inside and noticed the enemy rockets. 1LT Gennaro Mellis, reconnaissance platoon leader from Mount Vernon, N.Y., estimated the rockets and charges were a supply point for at least a battalion." "When we stopped, I thought we just had another bunker," Mellis commented. "My tunnel rat said he had 100 RPG rounds, but I thought he was kidding. We formed a chain and started passing them out, and they just kept coming and coming." The enemy ammunition was later evacuated and the bunker destroyed. DIV ARTY - The bullets in a .45 cal. automatic pistol are designed to save a soldier's life by killing an enemy, but recently two cartridges saved an officer's life in a very special way. 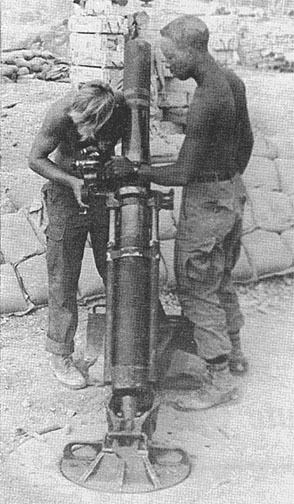 During a mortar attack on the forward position of D Btry, 3rd Bn, 13th Arty, a clip of ammo kept a piece of shrapnel from seriously wounding 1LT Seymour Levine of Brooklyn, N.Y.
Levine was on duty late at night near the 8-inch howitzers of D Btry when Viet Cong mortars started falling around him. "The first round exploded right in front of me and a piece of shrapnel creased my scalp, I turned to the left and dived for the ground as another shell went off a couple of feet away," related Levine. The attack stopped as suddenly as it started and Levine sought medical aid. "I was waiting for a dust-off and started emptying my pockets to give my things to another officer when I came across this clip," said Levine as he pointed to a clip of .45 ammo with a gash in the side. "I was carrying the extra clip in my left pocket just over my heart," he explained. His only thought at the time was . . . LUCKY! 1ST BDE - Airmobiling into the jungles outside the 25th Inf Div's 1st Bde base camp, as part of Operation Yellowstone, three companies of the 2nd Bn, 14th Inf "Golden Dragons," accounted for 27 enemy killed and the destruction of a large Viet Cong base camp. Ratpack 24, a gun team attached for air support, located Viet Cong movement, and LTC Alford Bracy, battalion commander, ordered his men to search the area. Bravo Co entered the base camp as Alpha and Charlie companies stood by to reinforce them. As Bravo moved toward the base camp, they came upon two bunkers and one-quarter-mile of communication wire, 100 feet of which was buried underground. Inside the base camp the Golden Dragon troopers found 4 huts with thatched roofs, 7 bunkers and a fortified trench stretching 100 meters. Further searching uncovered 2 tons of polished rice, 100 lbs of beans, 15 lbs of brown sugar, 5 rifle grenades, 3 hand grenades, and a pouch of 7.62mm ammunition. A case containing 2 lbs of propaganda documents was also uncovered. As Bravo Co began moving out of the base camp and Alpha Co followed behind, they came under enemy fire, which included rifle grenade and RPG rocket fire. In the ensuing fire fight the three companies killed 27 of the enemy. The companies suffered 1 killed and 21 wounded. Medevac helicopters were called in to lift out the wounded. Late that afternoon the companies were airlifted back to the 1st Bde forward base camp at Katum. 2ND BDE - PFC Steven Wilson of Sterling, Mass., was dejected: the prop wash from a helicopter had blown away an unread letter from home. That night, as he reached his position at a listening post just outside the night position of the 4th Bn (Mech), 23rd Inf, the 25th Div soldier found a paper bag. He checked the bag the next morning and found his lost letter inside. "I thought I'd run out of luck, but all the time, it was in the bag," he quipped. 1ST BDE - Major General F. K. Mearns, 25th Div commanding general, presented valorous decorations to the 1st Platoon of Bravo Co, 4th Bn, 9th Inf "Manchus," for outstanding heroism in action against regimental size North Vietnamese Army forces, 2500 meters from the Cambodian border on Jan. 5. Speaking before the battalion at Tay Ninh, MG Mearns congratulated the men for withstanding a 3-hour massive human wave assault coupled with a frenzy of mortar, RPG and .51 cal. machinegun fire. "These are the kind of deeds that make a nation and preserve freedom throughout the world. Of all I have read of the war in Vietnam or from the extension of my personal experiences the action that this platoon participated in is by far the most noble," MG Mearns said. "It is imperative that we continue to produce men and units such as this one. Manchus all can be proud to have a platoon such as this within their ranks," he added. Seven men were killed in the action and 17 wounded. The entire platoon of 29 men were decorated for personally inflicting severe losses on the NVA regular force. SAIGON (ARC-10) - Retired military personnel may find rewarding careers as Field Directors for the American Red Cross. Officials at Red Cross national headquarters are convinced that former servicemen make some of the best Field Directors and are actively recruiting them. Because of the buildup in Vietnam and a corresponding increase in Red Cross services, the need for new Field Directors is increasing. Following training and some on-the-job experience in the US, most newcomers to the ranks can expect a one-year tour of duty in Southeast Asia. In South Vietnam and Thailand, there are 155 Red Cross Field Directors and assistant directors meeting the emergency needs of over 22,000 servicemen each month. One of the chief responsibilities of a Field Director is counseling and helping servicemen in times of personal or family crisis. A background in the social sciences, therefore, is helpful. Also, a large part of the ARC worker's time is spent in helping servicemen by providing emergency communications service to obtain reports regarding families to alleviate apprehension and concern. Applicants may contact Red Cross National Headquarters personnel department in Washington or the personnel offices in any of the four area offices. They are: Eastern Area, 615 North St. Asaph St., Alexandria, Va.; Midwestern Area, 4050 Lindell Blvd., St. Louis, Mo. ; Southeastern Area, 1955 Monroe Dr., N. E., Atlanta, Ga,; or Western Area, 1550 Sutter St., San Francisco, Calif.
A new employee starts as an Assistant Field Director. The salary ranges from $6308 to $9114. There are additional allowances when serving in many overseas locations and the fringe benefits include generous annual leave and sick leave, life and hospital insurance, a retirement plan and credit union. Field Directors work in the majority of the 42 areas of the world where US Forces are stationed. A bill to allow certain servicemen to accumulate more than 60 days leave has been signed into law by President Johnson. He also signed two other bills that may lighten the financial load of some servicemen and their families. One increases the storage time of household effects for men in a missing status, and the other hikes the trailer allowance from 51 to 74 cents a mile. At the same time the President extended until Dec. 31, 1969, the law that allows servicemen in a combat zone to mail duty-free gift parcels costing up to $50. Under the leave bill, a member of the armed forces who has served more than 120 days in a foreign area where there is hostile activity can accrue up to 90 days leave. The leave in excess of 60 days can be credited only for use, not for payment. It must be used before the end of the fiscal year following the fiscal year in which service in the designated foreign area ends. He was a staff sergeant in the U.S. Army, a military adviser in Laos. The time was 1961. Captured by Communist elements of the Pathet Lao, he was bullied, threatened, half starved, harassed, confined for months to a "black hole." No matter what his captors tried, the sergeant did not break. He gave them only his name, rank, service number and date of birth - nothing more. Then he was shackled into a wooden stock that forced him into a cruel, painful position from which he had no relief. Still, this Army non-commissioned officer would neither betray his country nor compromise his honor. SSG Orville M. Ballenger won in the end. The communists failed to bend his will or flag his courage. He was repatriated 15 months after he began his ordeal. Ballenger was truly a U.S. fighting man. His actions are inseparable from the finest traditions of the American Armed Forces, as cited in the words of Article VI of the U.S. fighting man's code. What would be your reaction to a situation such as this: You've taken your car to a mechanic for some repairs and when you go in to pick it up, you overhear him saying to one of his friends, "I guess I could have done a better job, but what the heck, this is good enough to get by and he'll never know the difference." You would no doubt be pretty upset. After all, you're paying this man to do a job and you don't expect it to be done with a "get by" attitude. However, before you sound off and give this mechanic a piece of your mind, think about your day to day performance of duty and make sure that you haven't adopted the same outlook. When you are doing your job, are you an artist, a craftsman, with the particular tools of your trade? When you turn out a piece of work, is it the very best you can produce - or have you cut a few corners because "it's close enough for government work"? Whether you are an administrator, cook, baker, mechanic, or in one of the hundreds of other assignments in the Armed Forces, strive to do your job better than anyone else. You will certainly have a great deal more personal satisfaction knowing your job was done correctly and completely. You will also find that a little extra effort and attention to detail on your part will benefit you in the long run. A three-day Washington's Birthday clearance sale, which will save Exchange customers some $200,000 will be held Feb. 22 through 24 at selected main Exchange stores operated by the Pacific Exchange System, according to COL Eber H. Thomas Jr., PACEX commander. To provide Exchange patrons with a maximum opportunity to take advantage of the sale, merchandise will be consolidated and placed in special areas of selected stores. All merchandise will be identified by a single red line drawn through the original sell price, and the reduced price clearly shown near the old. Someone in B Btry, 5th Bn, 2nd Arty, coined the phrase, "You can't kill a Duster," and Gun Chief Charles V. DeShazer will vouch for it any time. DeShazer's gun is a twin 40mm tracked weapon commonly known as a Duster. The Dusters were originally designed as air defense weapons but have seen heavy use as direct fire weapons in Korea and Vietnam. DeShazer's gun is no exception, "this gun is about 25-years-old and she was brought out of mothballs for the Vietnam Conflict," said DeShazer, of Ellensburg, Wash., as he pointed to the battle scarred Duster. 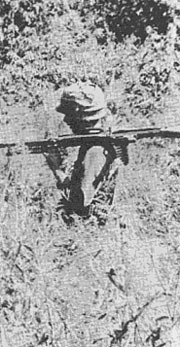 His gun, attached to A Btry, 3rd Bn, 13th Arty., as a perimeter defense weapon, was knocked out of action by VC during a ground attack on fire support base Burt 90 kms northwest of Saigon. When DeShazer arrived with three mechanics to repair the gun and replace the crew that was wounded during the attack, they found a charred hulk. According to track mechanic Vincent A. Schwartz, "the duster was a real mess. An RPG-7 shell destroyed the ammunition compartments, shot up the steering linkage and burned out the driver's compartment." Schwartz started the monumental job of cleaning out the hull and repairing the damage without much hope of success. "The wiring was all burned out but I managed to rewire most of it with claymore mine wire," explained Schwartz, from St. Paul, Minn.
At the same time, SP4 Paul G. Klug, turret mechanic, was repairing the turret and gun mounts. By cannibalizing the left gun he was able to get the right hand gun back in firing order, thus giving the Duster half its sting. Working at a feverish pace the men did all they possibly could and then, with a murmured prayer, they tried to start the Duster's engine. After a few disheartening tries the motor caught and the grand old lady roared back to life. "In order to steer it I had to sit on the transmission and twist an automotive wrench that was locked onto the linkage. It was really awkward but it worked and away we went," chuckled Schwartz. The Duster was driven back out to the perimeter and dug in with a good field of fire down a jungle trail. Two days later, during a daylight mortar attack on the fire support base, a near miss sprayed the Duster with shrapnel and perforated the oil cleaner. With tender affection for the old gun, Schwartz and Kluge stopped the leak and patched up the battle scarred side with odds and ends they were able to find. Sometime during the following night the Viet Cong fired two RPG-7 rockets at the duster but it seemed as if a divine hand was protecting the old gal. Both rounds fell just short of the gun and both shells failed to detonate. DeShazer was manning a Starlite scope and saw some movement in the jungle. He adjusted fire on the target and with the ferocious pride of a true warrior the Duster spit 40mm shells at the enemy. CU CHI - "If we had a medal or ribbon for every time a dog has saved a patrol from a dangerous situation, we'd have enough medals to cover the walls in our orderly room," said SGT Morris J. Summers, 20, of Fairmont, W.Va., commenting on the performance of the 38th Inf Scout Dogs Platoon. The 38th was one of the original scout dog platoons sent to Vietnam in June of 1966. There are currently 18 throughout the country. Assigned to the 25th Inf Div, the 38th serves the entire division, while being attached to the 1st Bn, 27th Inf. According to dog handler SGT John D. Shelton, 22, Belmont, N.C., when a unit wants a scout dog team (one handler and dog) to accompany them on a patrol, they make their request through G-3. The units usually give the scout dog team a few hours notice prior to moving out, but, says Shelton, "We can be ready to move in 30 minutes." The team usually stays out with a patrol three to four days, but Shelton has "been in the field as many as nine days without returning to base camp." The 38th tries to keep a fresh dog with the patrol as much as possible. 1LT William I. Brown, 24, Trenton, N.C., the platoon leader of the 38th, explained the purpose of a scout dog team as "to provide a silent early warning of danger to the patrol, thus preventing casualties." He continued, "the majority of our missions are with ambush patrols at night. The dog doesn't get tired as fast as during daytime operations such as search and destroy patrols, sweeps, or combat assaults." During a patrol the scout dog team acts as the point men. The handler keeps his dog on a six-foot leash attached to a special harness. The dogs have been trained to alert to such sounds as sticks breaking, metal clicking, peculiar odors, and movement in underbrush areas. "Anything the VC leave their scent on, the dogs will alert on," commented handler SP4 Fred D. Rowland, 20, of Struthers, Ohio. 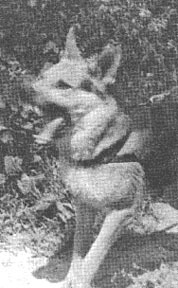 While on a sweep with the 2nd Bn, 14th Inf, in the Ho Bo Woods, Rowland and his scout dog "Troop" were leading the patrol. Troop alerted to the right front. The men of the patrol spotted nothing. They continued to move. Troop continued to alert to his right, and finally the patrol hit the "ready" position for trouble. "About this time," expresses Rowland, "VC not more than 50 meters to our right, opened up on us. We had two patrol members killed and eight wounded. It's very possible our whole patrol would have been killed if Troop hadn't given an alert." To say the scout dog team has a dangerous job is surely and understatement. During Operation Atlanta, in the Iron Triangle, Shelton and his dog "Kentucky" were on a night ambush patrol with the 1st Bn, 27th Inf "Wolfhounds." "We were walking down a road, and Kentucky alerted us to three anti-tank mines. Further along the road Kentucky alerted to the front. We checked ahead with the starlite (scope), and there were several VC a good 100 meters away, setting up mortars. Suddenly an RPG round landed about 20 yards from Kentucky and myself. If that would have been a mortar round, we'd be gone. Thanks to Kentucky our patrol got off the road with no one hurt." The scout dogs arrive in Vietnam from Ft. Benning, Ga., where they have received from 12 to 24 weeks of training. One training cycle consists of 12 weeks. The dogs are given two cycles to meet scout dog requirements. If after two cycles they fail to meet the prescribed standards, they are trained as sentry dogs. All of the dogs trained have German Shepherd blood and characteristics. The dog handlers have come either from Ft. Benning, Ga., where they have received 12 weeks of training, or from the 25th Inf Div as volunteers. 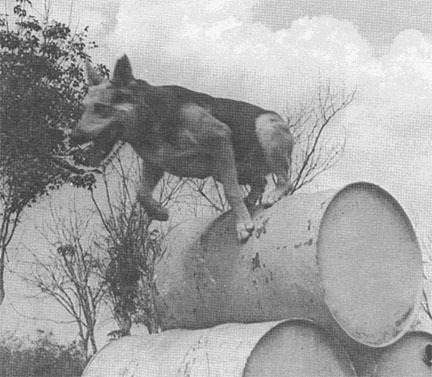 Handlers trained in Vietnam participate in 4 to 6 weeks of practical work with a dog, before they are considered "combat ready." Both men and dogs exercise on two training courses located near the 38th Platoon site. An obstacle course conditions the dog with various hurdles and barriers, while a mock patrol course simulates combat situations the team is likely to face in the field. 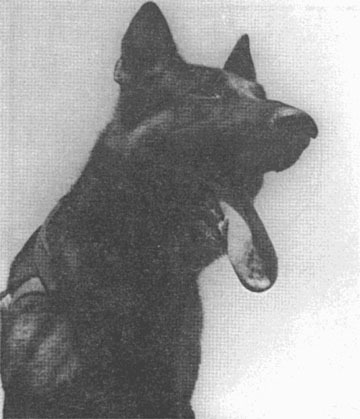 PSG Hugo W. Weiss, 32, Columbia, S.C., stressed the outstanding record of the scout dog teams. "We've had our scout dog teams out with over 2,000 combat patrols during the time this platoon has been in Vietnam, and not one of these patrols has walked into an ambush. We're top-dog all the way." TROOP ALERTS TO A STRANGE SCENT. SILVER AND SP4 TIMOTHY SCOTT ON PATROL. SILVER HURDLES BARRELS, ONE OF MANY OBSTACLES ON THE COURSE. 3RD BDE - There are many ways of keeping the local Viet Cong guerrillas low on supplies and one of these is through "Resources Control." 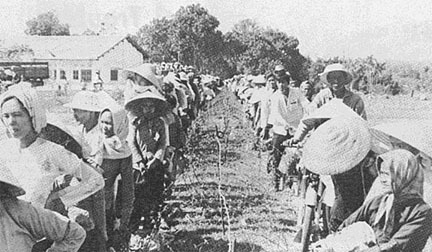 The idea of Resources Control is to keep local Viet Cong sympathizers from taking critically needed supplies to the Viet Cong that they need to conduct local guerrilla activities. One of the ways used by the 3rd Bde, 25th Inf Div, is through the use of checkpoints on the three roads leaving the village of Dau Tieng. The checkpoints are operated by the 3rd Plt, 25th MP Co of the 25th Div. They are assisted by the local National Police who are from the Tri Tam District. There are many things that the MPs and National Police check for. They make sure that there is not an excess of rice going out, no metal or plastic material being carried and no extra bicycle parts being taken out. 1LT Carl W. Smith, MP platoon leader, stated, "There has certainly been a slow down in supplies leaving the village that would have otherwise helped the local Viet Cong guerrillas." 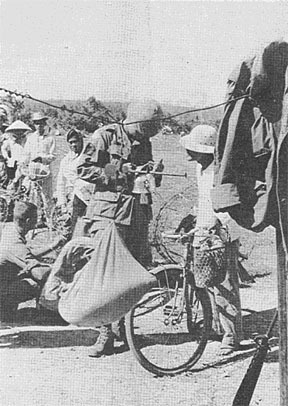 Through the joint efforts of the MPs and the National Police the Viet Cong of the area are having to find other means of getting supplies to their forces. As workers leave the village to work their crops they are checked for excesses of supplies or materials. 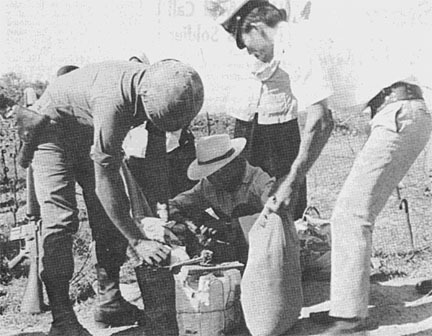 The MPs at Check Point Charlie weigh the amount of rice carried by a villager. Each is allowed 5 kilos of rice a day. The National Police and MPs work together in the joint effort of keeping the needed supplies from the Viet Cong near Dau Tieng. 3RD BDE - Little did PFC Donald Wadlington suspect when he tripped that his stumble would lead to the uncovering of the largest ammunition cache yet discovered in Operation Yellowstone. On flank security with his M-60 machine gun, Wadlington and his company, C Co, 2nd Bn (Mech), 22nd Inf, commanded by CPT William C. Allison, were sweeping into a Viet Cong base camp. After a short break, he shouldered his weapon and started out along the trail. Suddenly he tripped. As he landed, he felt the ground sag under his weight. Upon investigation of the cause of his fall, he discovered that he had been tripped by the corner of a large sheet of well-camouflaged metal. When he pulled the metal sheet aside, he found the entrance to a tunnel. Investigation of the tunnel revealed a munitions storage bunker in which a large amount of ammunition was stored. Allison speculated that it was a major storage point from the amount of munitions and equipment stored there, and the fact that it was all stored on a raised wooden platform and carefully covered with ponchos. For the remainder of the day, C Co, occasionally harassed by sniper fire, removed and destroyed the cache. The extensive cache held an aggregate of 220 82mm and 60mm mortar rounds along with 75 fuses, 101 75mm recoilless rounds, 170 RPG-2 rounds, 50 M-79 rounds, 8,000 .51 cal. rounds, and 11,000 small arms rounds. An M-1 carbine, two radios, and nine telephones were also recovered. 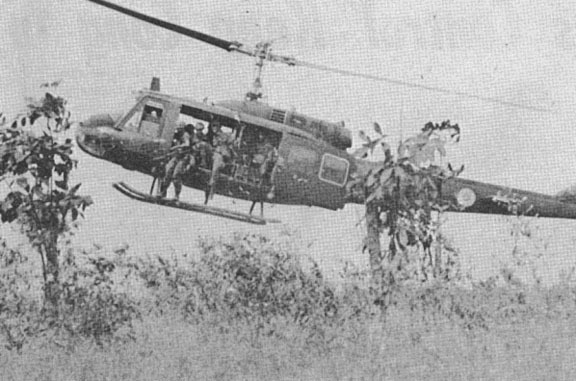 CU CHI - Three seriously injured Filipinos, pinned under an overturned truck in a water-filled ditch, were rescued by a U.S. Army helicopter crew. The trio was spotted from the air by MAJ Jack O. Johnson, 269th Avn Bn aircraft commander from Des Moines, Iowa, as he approached the Tay Ninh Airfield, 90 kms northwest of Saigon. Landing the aircraft nearby, Johnson found that one of the victims, a man, had been thrown clear of the wreckage, while a second man and a woman were trapped beneath it and in danger of drowning. Johnson reported that all three were unconscious and bleeding from multiple injuries. WO pilot Phillip E. Coates from Poplar Bluff, Mo., immediately radioed for medical aid, while Johnson and SP4 James E. Hensley, crew chief from Collingsville, Okla., began extricating the trapped couple. PFC Charles Patrick, door gunner from Tilghman, Md., administered first aid to the second man. According to Johnson, it took 20 minutes to free the two in the ditch. Since they were unconscious, Patrick had to hold their heads above water. 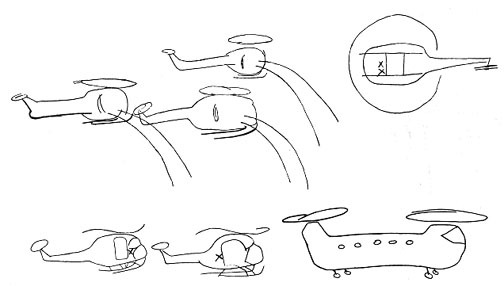 All three were made as comfortable as possible until a dustoff helicopter arrived to evacuate them to the hospital. 3RD BDE - Thanks to the elephant grass in which they had set up for the night, a patrol of the 3rd Bde, 25th Div, survived the recent battle of Soui Cut. Set up near the perimeter of fire support base Burt, the night ambush patrol from Bravo Co, 3rd Bn, 22nd Inf, heard many Viet Cong approaching just before midnight. Under cover of the tall grass around the position, the patrol watched three waves of a regimental size VC force pass by, some of the enemy only a few yards away. The troops were forced to remain in position and maintain almost complete radio silence as the battle raged all around them. As the human waves advanced and withdrew, four Viet Cong stumbled into the small perimeter but were quickly shot by the alert Americans. Despite gunship runs nearby, intense ground fire, and the brilliant illumination of flares overhead, the patrol suffered only one killed and six wounded. 1ST BDE - At the 25th Inf Div's 1st Bde base camp in Katum, rats are a bad problem. Poison doesn't seem to faze them, and they avoid traps. The only effective way to kill the rats is by shooting them, but a high-powered rifle or pistol bullet can go on a long way, even after passing through a rat. So Sp4 Roger L. Gardner of Madison Heights, Mich., has come up with an idea for effective but safe rat control. He removes the bullet from the shell casing and replaces it with a small plug made of soap. When fired, the soap "bullet" is accurate and lethal up to a few yards, and it then disintegrates harmlessly. And not only is it much safer, but the report is quieter too. "Works real good," said Gardner, holding up a zapped rat, "and the rats are getting the idea too. They don't bother us as much any more." 3RD BDE - Every GI in Vietnam looks forward to mail call and the letters from family, friends or sweethearts back home. But when one soldier receives 150 letters at one mail call he's bound to be a bit surprised. This is exactly what happened to Sp4 Joe Hettermann, HHC, 2nd Bn, 12th Inf, at a recent mail call. The funny thing about it was that he did not know any of the people who had written to him. After reading a few of the letters, things became a little clearer. It seems as though all of the letters were from the Sophomore Social Studies Class at West Bend High School, West Bend, Wisc., where an old friend, Mr. Dennis Welter, is teaching. One of the weekly projects of Welter's class is to write a weekly letter to a GI serving in Vietnam. 3RD BDE - At times the platoon sergeant of the 1st Plt of Delta Co, 2nd Bn, 12th Inf, has difficulty telling two of his troopers apart. But it is not the platoon sergeants fault, because having a set of identical twins in the platoon does cause a mixup at times. The twin brothers, PFCs Terry and Jerry Weigold of Marquette, Mich., find the mistaken identity to be nothing new to them. Beginning with their grammar school years at Marquette Elementary School, through their secondary schooling at Marquette Senior High and now the Army, their superiors have always had the same problem; Who is Who? Since being drafted into the Army in June of 1967 the brothers have served together in an identical manner. They completed basic training at Fort Campbell, Ky., after which they were both promoted to Private (E-2) on the same set of orders. After basic they were sent to Fort McClellan, Ala., for Advanced Infantry Training and were again promoted on the same set of orders to PFC upon completing their training. It was during this time that they almost had to separate and go different ways. "At Fort McClellan we were told that only one of us could serve in Vietnam," said Jerry. "But Terry didn't want me to go and I didn't want him to go, so we told them we both wanted to go and here we are." Since arriving in country two months ago both of the brothers have been awarded the Purple Heart. The brothers were wounded in the same week and both were wounded in the left side by shrapnel from the same type of weapon, incoming mortar rounds. So far their tour in the Army has been identical and both brothers hope it will remain that way. But both agree that they would like to finish their tours without receiving another Purple Heart. CU CHI - The Viet Cong mortar crew that zeroed in on the 1st Bn, 5th Inf's mess hall, must have had a weird sense of humor, according to Mess Sergeant Merwin Comer from Sioux Falls, S.D. The mortar attack started just fifteen minutes before supper and all the food was set out on the serving counter - roast beef, roast pork, baked macaroni, and assorted vegetables. Two rounds hit right in front of the line, according to Comer. "It was rough on the mermite cans," he lamented, "gravy gushed out all over everything. The whole place was riddled with holes." Fortunately for the mess hall personnel they ducked into the bunker built into the side of the mess hall, emerging several minutes later mad but unhurt. "It might have been too high in vitamins but it's sure got a lot of iron now," quipped Comer as he surveyed the wreckage and started preparing a substitute meal. Comer believes "a good mess hall always has reserves" and he was able to provide cold ham, cheese, and salad for the men in a few minutes. As if to add insult to injury the rounds "ventilated" every one of the field stoves. According to Comer, "Any other day I have to get on the cooks for having the stoves all over the place. Wouldn't you know that today they would have them all lined up like sitting ducks. "By the way, they also zapped the eggs for breakfast, so if you like them scrambled come on over," said Comer as he boarded a helicopter to get spare parts for the stoves. 3RD BDE - Two members of a small enemy squad attempting to sneak up on the night positions of Bravo Co, 2nd Bn (Mech), 22nd Inf., were killed by a three-man listening post stationed 75 meters from the "Triple Deuces" perimeter. SP4 Norman Pickins, SP4 Stanley Klasinski and SP4 Walter Dobzynecki had just settled down in place for the night when the Viet Cong squad made their way around some bushes to their side. With the claymores set to explode in another direction, Pickins opened up with his M-16. One of the enemy was immediately killed at a distance of seven feet and the other was found the next morning when Bravo Co swept the area. One AK-47 assault rifle and a hunting knife were captured. 2ND BDE - A 20 mile stretch of duty road in War Zone C has become the lifeline for the 25th Div's Operation Yellowstone. Each day convoys carrying vital supplies ramble along the road from Tay Ninh to a massive base camp being carved out of the thick jungle at Katum. Once a Viet Cong stronghold, the area is slowly being pacified, but danger still lurks along the entire route. Working closely with the 554th Engr Bn, elements of the 1st Bn (Mech), 5th Inf, and the 2nd Bn, 34th Armor, are securing the road as repairs are made on the road bed to keep the convoys moving as swiftly as possible. 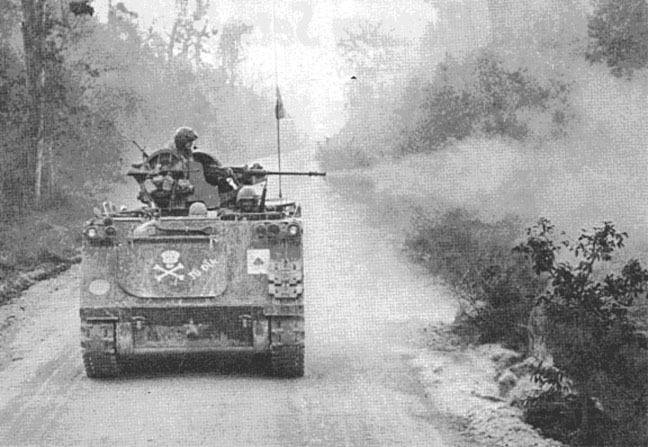 "Every morning we sweep the entire route from Tay Ninh to Katum with mine detectors," said CPT Lance Warner, commanding officer of Bravo Co. "As we move along the road, our armored personnel carriers fire into the jungle around the base of Nui Ba Den to prevent enemy ambushes." The sweep teams have been instrumental in preventing damage and injury to the men and their vehicles as they move along the road. Several mines are found and destroyed each day. "When we first moved into the area," commented Warner, "a convoy couldn't travel the complete route because of the condition of the road and the danger involved. Now the road is rapidly shaping up into a fine highway." 3RD BDE - During a recent search and destroy mission 60 kms northeast of Saigon, a 3rd Bde, 25th Inf Div, unit uncovered one of the largest medical caches ever found by the 3rd Bde. The medical supplies were uncovered during Operation Camden when Delta Co, 2nd Bn, 12th Inf "White Warriors," discovered a regimental size base camp, believed to be the headquarters of the 101st NVA Regiment. Being unable to complete the task of destroying the 120 bunkers and hundreds of feet of trench line found the first day, Charlie Co, along with a platoon of 65th Cbt Engrs, returned the following day to complete its destruction. While in the process of destroying the huge base camp, a forward security element came across a well concealed bunker and discovered the medical cache. Included in the supplies were 5 gallons of blood plasma, a blood pressure cuff, numerous surgical tools, 150 vials of anti-malaria vaccine, large rolls of sterilized gauze, 20 pounds of medical manuals, hundreds of pills, and many other drugs and antibiotics. Also found within the base camp were 20 pounds of documents, 15 CHICOM grenades, a complete radio transmitter and receiver, 30 pounds of NVA uniforms and more than 100 ammo pouches. 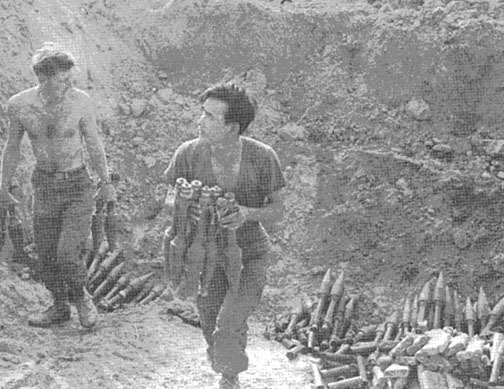 In total more than 4,500 pounds of explosives and 500 feet of detonating cord were used to destroy the huge NVA base. 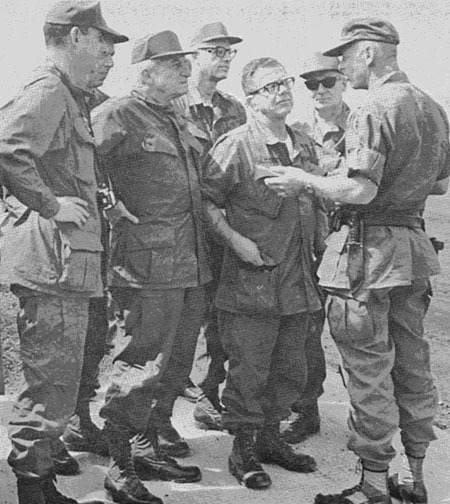 TAY NINH - To the men of C Trp, 3rd Sqdn, 17 Air Cav, a recent occurrence has taken on the appearance of the famous old-time mystery story: "Who done it?" It seems it all began one night when a group from the squadron were making a maintenance check on one of the helicopters at the chopper pad. Working under the lights of a nearby truck, their efforts were suddenly interrupted by the sound of an in-coming mortar round. Scattering and quickly taking cover, they awaited breathlessly for the upcoming explosion. Nothing happened! Regaining some of their self-composure, the men carefully searched around the immediate area for the unexploded projectile. Being unable to detect anything in the darkness, they decided to call it quits for the night. Upon resuming the search the next morning, a 4.2mm projectile of U.S. manufacture was found half embedded in the earth. 3RD BDE - Taking the right path at the wrong time proved the last mistake one Viet Cong RPG squad will ever make. Set up at the intersection of two paths was a four-man listening post from Alpha Co, 3rd Bn, 22nd Inf. "Even though it was dark out, we could plainly tell the VC were headed straight for us by their talking and footsteps," explained SP4 Lester S. Kinard from York, Pa. When the enemy squad was directly in front of them, the GIs blew their claymore, killing nine VC. Searching the area the next morning, the men found one RPG, one machine gun, and five AK-47 assault rifles. TAY NINH - A group flying air reconnaissance in support of 25th Inf Div units during Operation Yellowstone is also making an impressive record in the number of enemy killed. Piloting the low-flying OH-6A observation helicopters the men of C Trp, 3rd Sqdn, 17th Air Cav, have accounted for well over 100 confirmed enemy kills since Yellowstone began during the first part of December. It is a record that any unit would like to claim. What makes it so outstanding is the fact that the primary mission of the group is that of observation and reconnaissance. During one week's period the entire 3rd Sqdn reported 37 confirmed enemy kills and all but 10 of those were attributed to the men of Charlie Trp who fly the so-called "pregnant guppies." The first 23 days of 1968 has brought a total of 58 confirmed kills. "We get these kills because of the fact that we are right down on top of the enemy," said CPT Thomas P. Barrett, a platoon leader from Gadsden, Ala. "But on the other hand, we take more hits ourselves for the same reason," he continued. With C Trp continuing to fly reconnaissance, it is likely that the enemy may start entertaining thoughts of taking up a new occupation. It could be a wise thought, at that. 3RD BDE - While providing security for the artillery at fire support base Burt north of Dau Tieng, the 3rd Bn., 22nd Inf, recently flew in its biggest guns, the 4.2 inch mortars. Under the command of 1LT Hallisy, the 42 man platoon set up its mortar tubes to provide close fire support to the "Regulars" troops patrolling in the area, scene of the fierce New Year's Day battle of Soui Cut. In providing fire for screening, blocking, and contact missions, the platoon can have the mortars aimed at the enemy position and be ready to fire in less than 30 seconds after receiving a call from troops in the field. 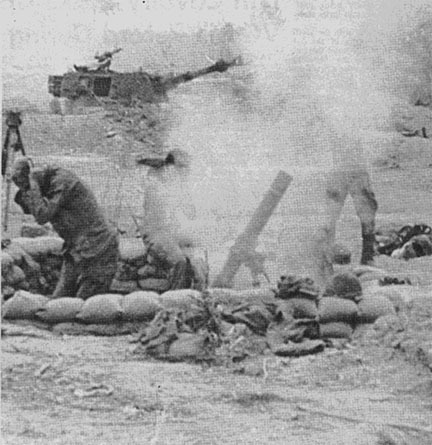 The call comes to the fire direction center, where the target is plotted in relation to the mortar position. Once the elevation and deflection have been determined, the fire direction center phones each of the three mortar crews who then aim the tubes. At the signal, all three tubes fire simultaneously. 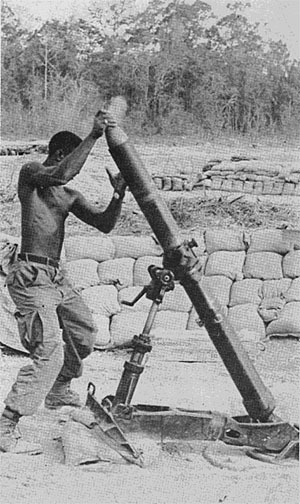 The 4.2 inch mortar is capable of hurling its 27 pound round over 5 kms to strike at the Viet Cong. After seven days and 1000 rounds fired, enemy activity near the base has shown a definite decline. ROUND IS DROPPED DOWN TUBE. THE ROUND IS ON ITS WAY AS MORTARMEN COVER THEIR EARS. 1ST BDE - Bravo Co of the 4th Bn, 9th Inf "Manchus," killed 8 Viet Cong and discovered a hidden enemy stronghold after hacking through the jungle thickets of Vietnam; during Operation Yellowstone. "The area was pockmarked with many bomb craters," PSG Cornell Johnson of Canton, Miss., said, "it just wasn't the place to find a base camp." The Manchus immediately secured the camp and began a thorough search of the area. "What surprised us was the construction of the bunkers; they were extremely well reinforced with double beams and were heavily camouflaged," CPT Alfred Baker, Bravo Co CO, said. "We tore them apart as well as we could by hand and built a huge arrow with tin from the roofs to mark the area for low altitude air strikes." As the Manchus swept back to their perimeter they received intense small arms fire from the dense undergrowth.